WHY DID YOU DECIDE TO WRITE FAST FORWARD? We realized that this a unique moment in history. The data is now in: Investing in women and girls drives both economic and social progress. Fast Forward makes the case that continuing and increasing that investment will bring about the world we all want to see. BUT THE BOOK IS ALSO ABOUT WHAT IT MEANS TO BE A SUCCESSFUL WOMAN, RIGHT? Oh yes. 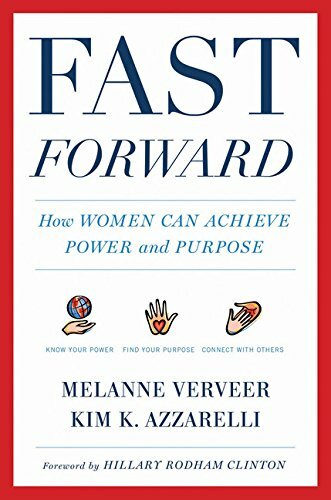 Fast Forward shows that as women are ascending through the ranks, they are redefining success by using their power for purpose— making a difference for others and redefining the way we work and live. ISN’T THAT EASIER SAID THAN DONE? Our book provides a toolkit that gives practical, hands-on lessons on how women can achieve power, find their true purpose and then connect with others. WHO BENEFITS WHEN THAT HAPPENS? Everyone wins. When you reach out, you of course help the other person. But once you have purpose in your life, once you are doing what you were really meant to do, you attain real and lasting satisfaction. Your work goes better, as does your whole life. AND WHAT ARE THE LONG-TERM RESULTS? Unleashing the vital, untapped force that is the power of women will have positive ramifications for decades to come. This is how we’re going to change the world. This is how we will fast forward.